"We have been called criminals, but we are not. We are rebels, fighting for the people, fighting for you." Lothal orphan. Mandalorian explosives expert. Lasat Honor Guard. Ill-tempered Astromech Droid. Twi'lek pilot. Jedi survivor. These are the crew of the Ghost and the protagonists of the hit show Star Wars Rebels, and they will soon arrive to your games of X-Wing™ in the Ghost Expansion Pack. 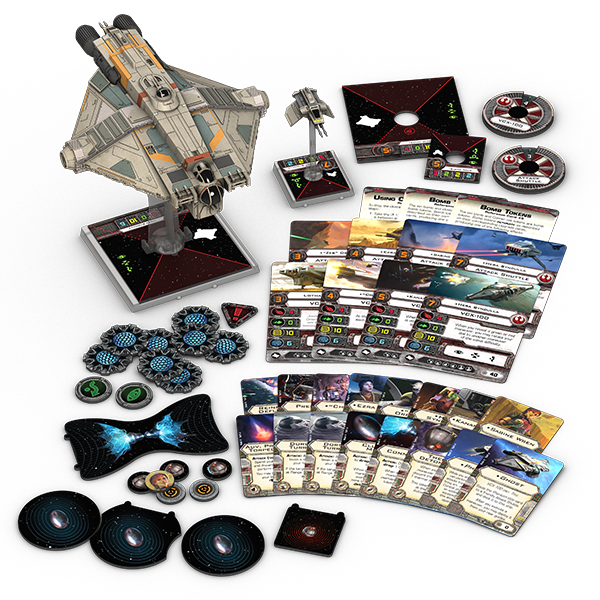 The first Standard Play expansion to incorporate materials from Star Wars Rebels, and one of the most keenly anticipated expansions in X-Wing Wave VIII, the Ghost Expansion Pack allows you to fly to battle with Kanan Jarrus, Hera Syndulla, Ezra Bridger, and the rest of the Lothal Rebels. This fact, plus the fact that it introduces not just one, but two ships, makes the Ghost Expansion Pack an excellent entry point for new players looking to experiment with tactics beyond the X-Wing Core Set or The Force Awakens™ Core Set. Just as the crew of the Ghost most often conduct their missions against the Empire as an isolated Rebel cell, the Ghost Expansion Pack stands well on its own. 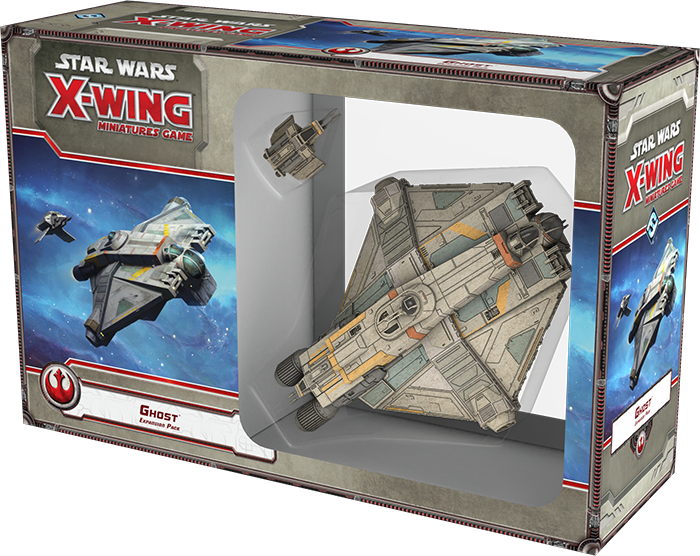 Combined with your Core Set, this expansion provides everything you need to assemble a fun and competitive Rebel squadron. In fact, the Ghost Expansion Pack comes with so much material that we need two previews just to explore it all. Today, though, we start by looking more closely at the expansion's two miniature starships, the VCX-100 light freighter and the attack shuttle! 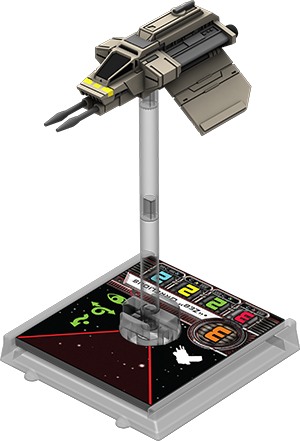 Foremost among all the components of the Ghost Expansion Pack are its two detailed miniature starships, both of which have been lovingly rendered at the same 1/270 scale used throughout all of X-Wing Standard Play. Notably, rendering these ships at 1/270 scale makes the first of them, the VCX-100 freighter, a massive presence on the battlefield. The largest large-base ship currently in X-Wing, the VCX-100 is even larger than the Galactic Empire's VT-49 Decimator, and it dwarfs even some of the game's other large-base ships, like the YT-2400. This behemoth enters the game with four attack, zero agility, six shields, and a whopping ten hull. Then, its brute force can be further enhanced by a wide array of possible upgrades, including a system upgrade, turret, two torpedoes, and two crew slots. 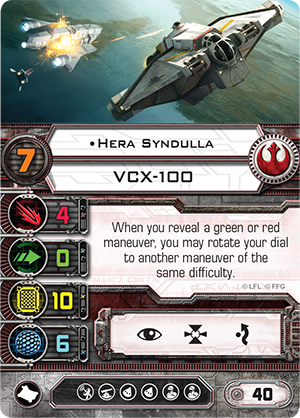 Finally, you can even equip your VCX-100 with the Ghost Title upgrade to field it in your games as though it were Hera Syndulla's signature vessel. Named for her ability to evade Imperial sensors, the Ghost featured static jammers and baffled dampeners that meant it detected on many sensors as mere cosmic radiation. 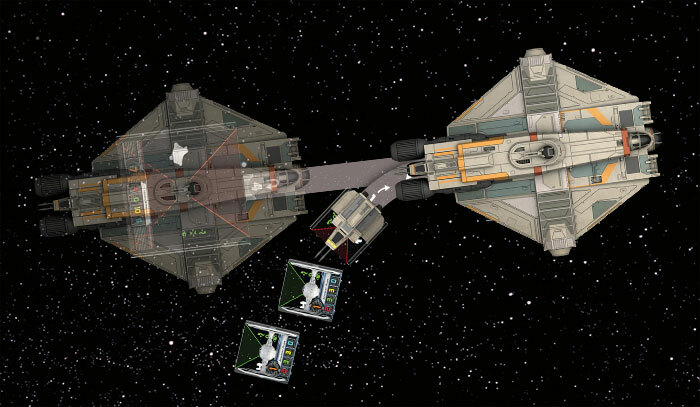 On multiple occassions, these modifications allowed Hera Syndulla and her crew to avoid getting caught in fights that they couldn't win; however, the Ghost and her crew saw their fair share of battle, as well. Accordingly, it was equipped with a nose turret gunner station underneath the cockpit and a 360-degree Dorsal Turret that was mounted midship. 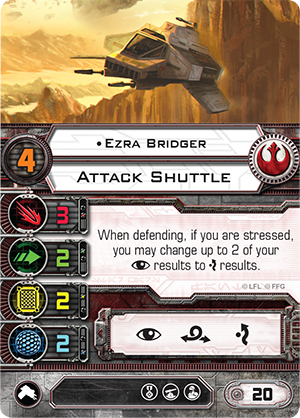 The second ship in the Ghost Expansion Pack is the attack shuttle, a worthy addition to any Rebel squadron. The attack shuttle offers three attack, two agility, two shields, and two hull, as well as the focus, evade, and barrel roll actions. 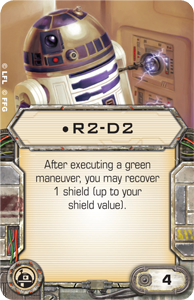 Notably, it is also the first Rebel ship for X-Wing Standard Play that comes without the acquire target lock action and the first to arrive without a non-unique pilot. 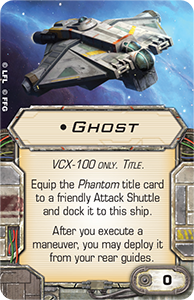 Instead, the attack shuttle is reserved strictly for the crew of the Ghost, and you can even dock it to the Ghost when you give it the Phantom Title. In that case, the Phantom remains completely immune to enemy attacks until you choose to deploy it after the Ghost executes a maneuver. 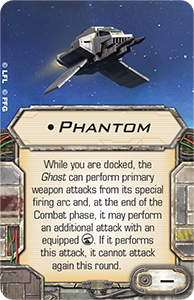 By starting docked and then deploying in the heat of combat, the Phantom can slip into battle in the most surprising of fashions, especially if it's docked to the Ghost piloted by Hera Syndulla or another VCX-100 pilot with higher pilot skill than those on your opponent's ships. The Phantom deploys from the Ghost to catch a pair of TIE fighters by surprise. One ship cannot stop an Empire, not even a ship as powerful as the Ghost. But one ship can help spark a larger rebellion. And two ships, working together like the Ghost and the Phantom, can win many battles and many victories in the name of freedom. In our next preview of the Ghost Expansion Pack, we'll look at how it brings each of the protagonists from Star Wars Rebels to life as both pilots and crew members. 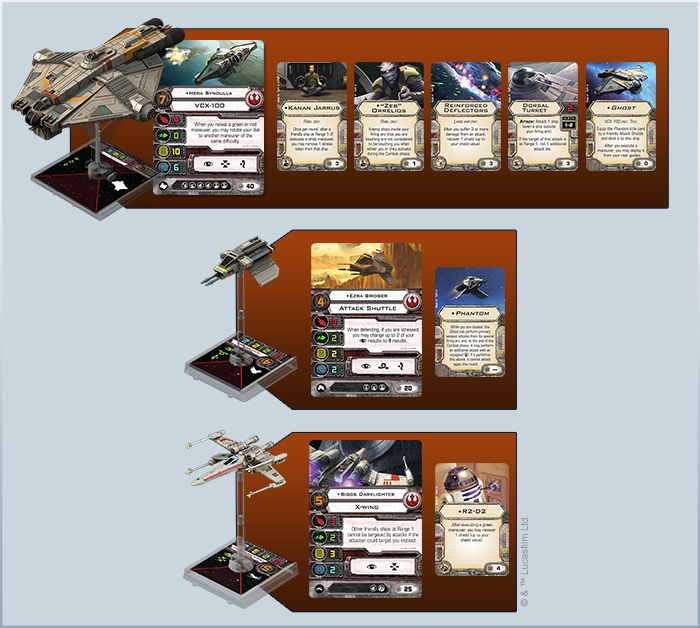 For now, though, it's enough to note that when you pair the expansion with either the X-Wing Core Set or The Force Awakens™ Core Set, you can find any number of thematic ways to build a full 100-point X-Wing squad based primarily around the Ghost and her crew. One example is the squad depicted below, which pairs Hera Syndulla's Ghost with an X-wing flown by Biggs Darklighter . The Ghost is large, powerful, and versatile. However, it is not an agile ship, so this list pairs it with Biggs Darklighter, whose ability to draw fire away from friendly ships at Range "1" can reduce the amount of damage the Ghost suffers early in the game. That means you should be able to maneuver Hera Syndulla into attack position relatively unscathed, at which point you can either choose to deploy your Phantom or keep it docked in so that your Ghost retains the more versatile attack options that the Phantom grants it. 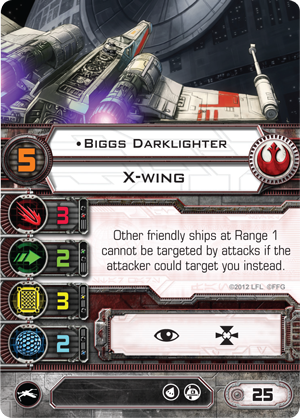 Eventually, thanks to the fact he'll draw almost all the early fire from your opponent's list, Biggs Darklighter is likely to be shot down. 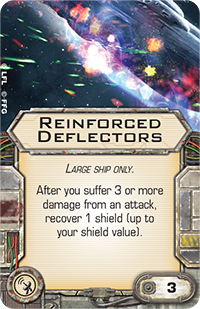 At that point, your Reinforced Deflectors help to mitigate the Ghost's poor defenses, as does "Zeb" Orrelios. 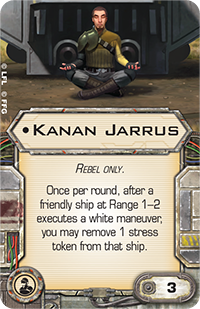 While he doesn't directly add to your defenses, he allows you to take better advantage of Hera's unique ability to change her maneuvers, even should those maneuvers cause you to overlap an enemy ship. 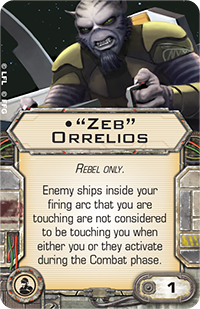 So long as you can keep that ship in your firing arc, "Zeb" allows you to attack, even when your ships are touching, and any upgrade or action that allows you to keep firing with your massive primary attack of four dice plays directly into the philosophy that the best defense is a good offense. "We started by wanting to fight the Empire. Somebody had to do something about the terror and injustice they're spreading across the galaxy." One ship cannot stop an Empire, but one ship can still make an impact, especially when that ship is the Ghost and her crew is full of individuals as spirited and talented as Hera Syndulla, Kanan Jarrus, Ezra Bridger, and their companions. 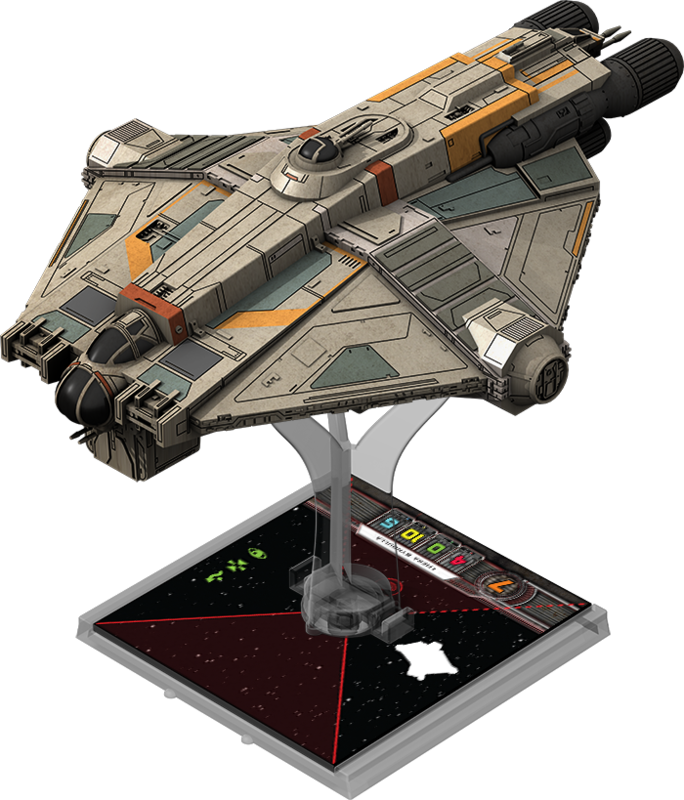 Just as these characters strike blow after blow against the Empire in Star Wars Rebels, they offer you myriad ways to battle the Empire in X-Wing. After all, all six of the show's protagonists appear as both pilots and crew upgrades. 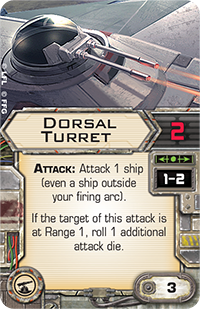 In our next preview, we'll take another, closer look at these characters and how the Ghost Expansion Pack brings them to life in your games of X-Wing!